Solid steel is used as an anti bucking element in the cable for providing very high tensile strength in outdoor cables where the cable has to be pulled or blown into ducts. The steel is hot rolled with anticorrosion treatment, Steel is chosen when extreme cold temperature performance is required since it exhibits good temperature stability. Stranded steel is used as an anti bucking element for providing both ﬂ exibility and high strength. FRP Rods combine the high performance properties of glass reinforcements with unique resin formulation to produce a strong and cost effective non-metallic cable strength member. The dielectric nature of glass fibers renders them immune to electromagnetic interference and lightning. In addition to being dielectric, FRP has high young modulus and exhibits high tensile strength and low weight. FRP is used when all dielectric construction is required. High strength aramid yarn strength member ensures tension resistance and long term stability. Aramid yarn is a dielectric with high modulus and low specific weight. It is mostly employed as a central strength member for indoor tight buffered cables. PE is used mostly for outdoor applications. PE sheath acts as a moisture barrier as well as a protection to the core. PE will not crack or become brittle at low temperatures and will retain its mechanical properties and stability at high temperatures. PE is very resistant to water, chemical and solvents and thus used as sheath for outdoor installation. PE can be UV resistant if carbon black additive is added. It will exhibit extremely good aging properties and high UV and weather resistance. PVC is mostly used mostly for indoor applications. It is most widely used because of its good mechanical and electrical properties combined with cheap cost. The PVC material may include special carbon black additives for being UV and weather resistant. Fire retardant PVC will not allow ﬁ re to propagate along the cable when ignited. Fire retardant PVC jacketed cables will usually meet the ﬂ ammability requirements of UL 1581(VW-1) and IEC 60332-1. With special design, the cables can meet IEC 60332-3A/C or UL 1666 (OFNR riser grade or UL 910 (OFNP plenum grade). LSZH material is used mostly for indoor applications. When exposed to ﬁ re it will retard ﬁ re propagation while emitting non toxic corrosive halogen gases (halogen free as per IEC 60754-1 and IEC 60754-2) and low amounts of smoke emission as per IEC 61034-2. 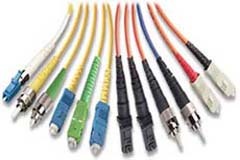 LSZH cables can usually meet the ﬂ ammability requirement of UL 1581(VW-1) and IEC 60332-1. With special design, the cables can meet IEC 60332-3A/C. Fiber glass is a dielectric with high compressive strength high modulus and light weight. It is characterized by its great abrasion resistance. Fiber glass yarn is usually used in a form of thin fiber bundles or roving. Compared to aramid yarn, ﬁ ber glass yarn is mucheasier to cut. Fiber glass yarn has similar impact resistance as steel. Aramid yarn is a dielectric with high strength, high modulus and light weight. Aramid yarn is usually produced in its natural yellow color. Because of its toughness, aramid yarn is difficult to cut and requires a high quality scissor dedicated for cutting aramid. Aramid yarn is 5 times stronger than steel. The weakest aspect of aramid yarn is its compressive strength and that is one of the strong points of fiberglass yarn. Putting the two together combines the tensile strength, toughness, and light weight of aramid yarn with the compressive strength and rigidity of ﬁ berglass yarn. Flexible dielectric armour is made of a thick layer of fiber glass roving, It is a dielectric with high modulus and low weight glass. Fiberglass armour is used when there is a need for dielectric and high flexibility. Fiberglass armour is a fraction of weight of the steel wire armour for identical performance level. Helical wrap of galvanized steel wire armour provides the best protection against rodent attack and mechanical damage, also offering high tensile strength and crush resistance. The double armour is designed for underwater application. The double armour wires provide the necessary tensile stiffness needed during installation to prevent excessive strain of the optical ﬁ bers, mechanical protection from outside disturbances, as well as the structural strength needed for underwater cables as relatively long lengths of cable must be lifted to bring the cable to the water's surface for servicing. Without the strength provided by the double armour, the weight of the cable could break the optical ﬁ bers at the point of lifting the cable. The braided bronze armour is used for increased mechanical protection for offshore and shipboard cables. With this design, the cable can pass IEC60332-3A. The bronze armour layer may also be used to assist in locating buried cables. This is accomplished by imparting a signal to the bronze armour and detecting the signal by suitable above-ground apparatus. The nylon sheath provides necessary protection against rodents and termites and the smooth surface of nylon makes laying of cables in duct much easier. This material does not degrade the cable mechanical properties or causes environmental damage. PU is used for harsh environments requiring very high flexibility. This cable material is characterized by its good resistance to humidity, moisture and weather, high flexibility, stable electrical characteristics, and excellent resistance to abrasion or chemicals PU provides good tear strength, providing cut-resistance in many rugged environment. With special design, the cables may include a flame retarding additive. This most employed fiber has a simple step index structure. It is optimized for operation at the 1300 nm band and can also operate in the 1550 nm, but it is not optimized for this region. The typical chromatic dispersion at 1550nm is high at 17ps/nm-km. Dispersion compensation must be employed for high-bit-rate applications. The attenuation is typically 0.2dB/km at 1550nm and the PMD is less than 0.1ps/km. This ﬁ ber is designed for use in long distance, high bandwidth systems such as telecommunication and CATV. The ITU-T G.652 standard SMFs are not optimized for WDM applications due to the high attenuation around the water peak region. ITU G.652.C-compliant fibers offer extremely low attenuation around the OH peaks. The G.652.C ﬁ ber is optimized for networks where transmission occurs across a broad range of wavelengths from 1285 nm to 1625 nm. Although G.652.C-compliant fibers offer excellent capabilities for shorter, unamplified metro and access networks, they do not fully address the needs for 1550-nm transmission. The attenuation parameter for G.652 ﬁ ber is typically 0.2 dB/km at 1550 nm, and the PMD parameter is less than 0.1 ps/ km. Conventional SMF has a zero-dispersion wavelength that falls near the 1310-nm window band. SMF shows high dispersion values over the range between 1500 nm and 1600 nm (third window band). The trend of shifting the operating transmission wavelength from 1310 nm to 1550 nm initiated the development of a ﬁ ber type called dispersion-shifted ﬁ ber (DSF). DSF exhibits a zero-dispersion value around the 1550-nm wavelength where the attenuation is minimum. The DSFs are optimized for operating in the region between 1500 to 1600 nm. With the introduction of WDM systems, however, channels allocated near 1550 nm in DSF are seriously affected by noise induced as a result of nonlinear effects caused by FWM. This initiated the development of NZDSF. G.653 ﬁ ber is rarely deployed any more and has been superseded by G.655. Using nonzero dispersion-shifted fiber (NZDSF) can mitigate nonlinear characteristics. NZDSF fiber overcomes these effects by moving the zero-dispersion wavelength outside the 1550-nm operating window. The practical effect of this is to have a small but ﬁ nite amount of chromatic dispersion at 1550 nm, which minimizes nonlinear effects, such as FWM, SPM, and XPM, which are seen in the dense wavelength-division multiplexed (DWDM) systems without the need for costly dispersion compensation. There are two ﬁ ber families called nonzero dispersion (NZD+ and NZD–), in which the zero-dispersion value falls before and after the 1550-nm wavelength, respectively. The typical chromatic dispersion for G.655 ﬁ ber at 1550 nm is 4.5 ps/nm-km. The attenuation for G.655 ﬁ ber is typically 0.2 dB/km at 1550 nm, and the PMD is less than 0.1 ps/ km. In order to overcome the defects of G652 and G655 optical ﬁ bers, G656 fiber is developed. G656 fibers are designed for use in long haul transmission system and metro network. CWDM and DWDM can also be applied on S+C+L bands with these types ﬁ ber. These fibers are manufactured by PCVD process. The minimum dispersion value from 1460nm to 1625nm is greater than 2ps/nm km; the maximum value is less than 14ps/nm km. The effective area at 1550nm is around 52 to 66μm. The excellent polarization mode dispersion properties help the ﬁ ber to meet the requirement of high bit rate transmission. The PMD co efﬁ ciency of these ﬁ bers is less 0.05 ps/km. By use of improved PCVD process, excellent attenuation of these fibers was obtained, the water peak around 1385nm is almost removed; attenuation from 1310nm to 1650nm is less than 0.4 dB/km, attenuation at 1550nm is less than 0.22dB/km. Excellent attenuation performance will help the ﬁ ber to utilize the bandwidth more effectively. OM3 MMF has a 50-um nominal core diameter and a 125-um nominal cladding diameter with a graded refractive index. The attenuation parameter for OM3 fiber is typically 0.9 dB/km at 1300 nm. The main application for OM3 ﬁ ber is for 10G Ethernet network where very long transmission distance is required. This ﬁ ber is optimized for use in the 850-nm band. MMF has a 50-um nominal core diameter and a 125-um nominal cladding diameter with a graded refractive index. The attenuation parameter for G.651 ﬁ ber is typically 0.9 dB/km at 1300 nm. The main application for ITU-T G.651 fiber is for local area network. This fiber is optimized for use in the 1300-nm band. It can also operate in the 850-nm band. 62.5/125um multi mode fiber per ITU-T G651, OM1 grade per ISO/IEC 11801. 9/125um or 50/125um or 62.5/125um ﬁ ber. Composite Cables containing two or more fiber types within the same cables. 9/125um or 50/125um or 62.5/125um fiber plus copper cable. Hybrid Cables containing two or more ﬁ bers and copper conductors within the same cables. For moderate protection of the ﬁ bers against water penetration. For better protection of the ﬁ bers against water penetration. The ﬁ bers are tightly buffered by a plastic material. Buffer diameter is 0.9mm. A semi-tight buffer, 0.9 outer diameter, gel ﬁ lled. This is a special coating applied over the cable jacket to reduce the damage of the cable by repelling insects and the termites. The anti termite coating does not degrade the cable mechanical properties or causes environmental damage. The aluminium moisture barrier tape offers extra protection against water ingress. The tape is applied around the cable cores to form a moisture barrier along the entire cable length. Used in lighting waveform monitoring system, an observation system for overhead test line, maintenance data information system, power line protection system, power line operation system, and unmanned substation monitoring. For aerial self supporting aerial installation at short, medium and long span distances. Adapted for high voltage, middle, small span conditions in Power Transmission System or mazy terrain such as river spanning, mountains. For self-supporting aerial installation, with steel messenger wire. The Fig 8 cable is recommended for spans up to 150m. The messenger wire is made of 7 stranded galvanized steel elements having a diameter and tensile strength to match the cable weight. For use in long haul communication system, subscriber network system, distribution, feeder network system and local area network system.